Graduated, PHP Web Developer, Blogger, Composer, Music addict, Swimmer, and a silent human being who seeks good friends and opportunities on-line. If you are a daily user of the internet or you are so interested in smart devices and related news or trends, you may have seen that the majority of the smartphones, tablets can be shopped online going through a virtual cart and bring them down to Sri Lanka using a standard or an expedited shipping method. Apart from following that route, you can basically visit a retail mobile store in Sri Lanka and buy your most needed mobile device, a phone or a tablet PC that suits your wallet. There are numerous known authorized dealers for those devices as of now established in Sri Lanka for consumers to go and shop. Availability of mobile devices from popular and well known brands like Nokia, Samsung, Apple, Motorola and HTC in here, is truly tremendous and if you wish to have a walk in a shopping center, you may discover a bunch of shops and stalls that showcase a heap of mobile devices bearing those branding. However the same tale about accessibility of Nexus devices changes assuming that you are living in Sri Lanka or any viable country, where device purchasing is restricted on Google’s Play Store. You scarcely discover a shop or any retail store that offers Nexus devices, particularly as of recently released Nexus for somewhere close to the original price point. That being the main reason behind less popularity and availability of Nexus devices among Sri Lankans and the trouble of getting one in hands other than importing them here through some individual who lands here. In this manner, Nexus units might be classified as uncommon and versatile devices, which makes just a lucky few to have a chance to own them inside Sri Lanka. A solution for this has recently been sorted out that allows Sri Lankans to buy items online and bring them down here without costing more or waste much time on receiving the paid items especially from country restricted foreign web stores like purchasing devices from Google’s US Play Store. The suggested workaround for this is using an online service that receives and then forwards shipments from US to anywhere in the world called HopShopGo.com, to buy your items and get them conveyed to your doorstep in a few days. Other alternatives which serve in the same way are ReShip.com, us2me.com and myusa.com however they charge an initial payment to sign up to procure their services. Apart from those outside-the-country solutions, visiting global shops established here might seem easy yet the compromised services they offer could be not worth the time and penny we spend. So here goes the easiest method explained in a simpler way chosen from aforementioned first method, using HopShopGo to ship items to Sri Lanka from country restricted online web stores. Step 1 - Accessing blocked shopping site – In this step you have to actually be some sort of computer literate and familiar with internet usage and services. To do this you need to install some software on your computer that bypasses the access block to the online store your item is listed. For this you can either try ‘Hotspot Shield‘ (figure B) or ‘Tunnel Bear‘ applications on your computer by downloading and installing them. If you are using ‘Tunnel Bear’ then register for a free account worth of 500MB data. After following either way, run one of those applications and try to access your online Nexus shopping page at Google Play Store from your favorite web browser and you will have the ability to gain entrance to those blocked stores (figure C). (Make sure that these applications can only spoof your access location as you are surfing the web from US or UK) Now we have access to see and place an order at Google Play Store. What’s next? Step 2 - Go to HopShopGo.com and signup for free, but you will be asked to specify a PayPal account (b in figure D) with your credit/debit card connected to it. At the end you must login to your account and you will find a U.S. mailing address for your name (a in figure D). Then what? Step 3 - Now go back to Google Play Store and pay for your phone. During this process remember to specify your HopShopGo U.S. address for both shipping and billing addresses and complete your payment process without any hiccups. DONE. Step 4 - Once the shipment is received at your U.S. address, the company will usually notify you within a day via email along with the estimated cost for shipping to Sri Lanka based on the type of shipping you choose (standard in 5-6 days or expedited in 3 days). There you may pay the amount they say online and you will be given an air waybill / tracking number. You can login to HopShopGo and check your package status and more information or pay shipping charges (c in figure D). Step 6 - When your phone arrives here you will be given relevant documents either by DHL or FedEx to get the approval from TRCSL, which doesn’t take more than 15 minutes. Upon approval, you need to inform DHL or FedEx and the next day they will deliver you your Nexus at your doorstep. No waits, no wastes. This method is not only valid for buying Nexus devices but you can also use these steps when you buy and ship items from any U.S. based shopping store and perhaps you may not need to go through the first step if the web site is not blocked for your region. 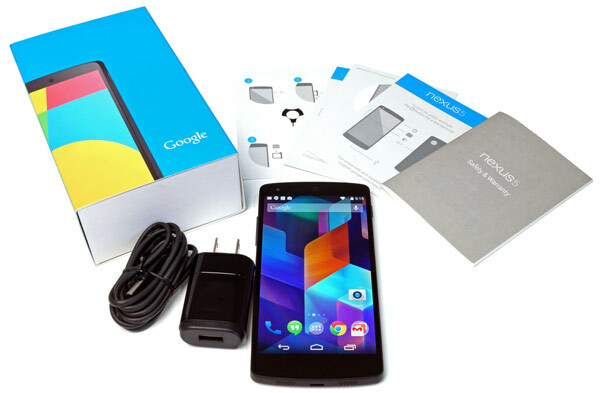 It’s been more than three months since the Nexus 5 has made an official public appearance, to be precise its release on October 31st last year, allowing people to place orders directly from Google’s play store and the pure Google experience that is stuffed inside this gorgeous flagship device has dramatically changed the way people look at mobile devices. The Nexus story was quite a little bit old by now but when you look back how it has changed over time was pretty amazing. We have come a long way since the first Nexus device suitably named to the Nexus One announced in 2010. Now we are in the new generation of apparently, ultra powerful, ever evolving smartphones at this point. Nevertheless for whatever reason, when Google was going to release their new version of the Nexus device along with their sweetest version of Android layered around it into this new era, they didn’t make a big deal about it with announcements and subsequent releases. For this search engine giant, publicity was never needed to be sought and still their recent Nexus devices sold out in minutes like hot dogs out of the stove. The Nexus 5, with its sleek and smooth look managed to captivate the prospective users even before it hit the market officially. After the successful Nexus 4, it’s clear that Google has built up a relationship with LG for the following Nexus, which made both devices sold out in first few minutes as it was first released for placing orders. Unlike other flagship contenders like Samsung Galaxy S4 and HTC One, everybody was quite anticipated to see how would it look, what features would it sport and who would take the challenge to cater the demand by manufacturing it for Google. Speculations twirled around the tech savvy people letting them wait for the successor to the previous Nexus, the 5th of its kind. Nexus 5 was made after LG’s own flagship smartphone named LG G2, designed with a minimal yet more premium and sophisticated look and feel, having almost of all its features trimmed a little bit down to match the Google’s low price point starting at 350 dollars for the 16GB version. It first came with two color choices say black and white and now it’s available in bright red too. The competitive specifications of Nexus 5 were good enough to bring a great smartphone experience as a reference device for the industry and for developers or general consumers, bundled with pure and powerful updated Android experience currently available unlike the predecessors. Most importantly the main advantage in Nexus devices is quick over the air Android updates. Evolution of Nexus series has been extraordinary. The look and feel as well as the hardware specification have improved over a short period of time. Google uses their Nexus line to introduce the latest version of Android operating system and this time they released the tastiest Android experience they have ever made Android 4.4 KitKat with new user interface improvements and other eye-catching features that comes only available for the Nexus 5 at the moment. The new Google Experience launcher provides translucent notification and navigation bars with a second home screen fully dedicated to ‘Google Now’ with the ability to initiate voice searches by simply saying “Okay Google” when you are in any home screen. The updated camera was improved to produce better image quality with clear and saturated colors as a result of optical image stabilization plus incremental updates to Android KitKat in order to make the imaging experience more serviceable. Initially the downside of the Nexus 5 was its battery life and it’s not as pathetic as it seems on average usage, but someone would feel like reaching for the charging cable earlier than any probably it should compared to competitors. With the Nexus 5, you are getting exactly what you are needed without having any bloatware or heavy applications that provides sky high features. It is a phone that suits the daily drive, because it is simple and it does what you need to do without giving any fuss. A rumor which started circulating a few weeks back stated that we might have to rely on much expensive Google Play edition devices to get our hands on pure Android experience, as it seems the Nexus line might come to an end this year, which surely is not a good news for many consumers. So let’s have our fingers crossed until 2015 to see these rumors to get some backing. Till then enjoy pure Android on Nexus.